Proper care of the mare during gestation and lactation determines the health of the mare, current foal and the foal-to-be. Improving diet utilization can aid the mare in meeting heavy nutrient demands, hormonal changes and immune system challenges during gestation and lactation. Nutrition for the pregnant mare is actually the feeding of two animals: the mare and developing foal. Over 50% of the fetus’ growth occurs during the final 100 days of the mare’s 340-day gestation period. Inadequate nutrient intake by the mare during the final third of gestation can restrict fetal development and may result in the birth of a weak foal. The mare must be in proper body condition at foaling to withstand the rigors of giving birth, initiating lactation and, if desired, being prepared to conceive at the foal heat. A mare encountering an energy deficiency will ration its energy supplies on a priority basis to body maintenance first, lactation second and lastly to producing a future foal. Colostrum, the first milk produced after foaling, is richer in proteins, minerals and vitamins than later milk. 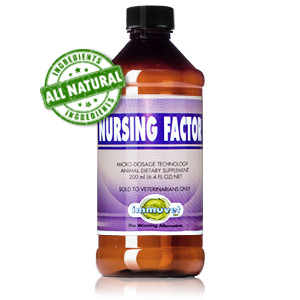 The high protein content results from elevated levels of globulin and albumin. These immune bodies are transferred from the mare’s blood to the milk and ingested by the new-born foal for disease resistance. The mare’s health status during the later stages of gestation will determine the amount and quality of colostrum produced for the new-born foal. While the importance of the foal consuming colostrum is well recognized, the impact of nutrition on colostrum quality and quantity is less acknowledged. The new-born foal is dependent upon the mare’s milk for nutrients for growth and support of the immune system. 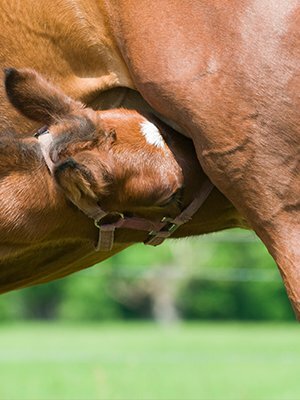 Although the lactating mare and cow are different animals, basic nutritional and physiological factors are applicable to both sets of mothers. Milk quality and quantity are definitely impacted by the balance and quantity of nutrients consumed. Proper supplementation of minerals and vitamins is the foundation for a good lactating mare program. A calcium deficient diet for the mare can result in poor skeletal growth by the nursing foal. The mare’s intake of energy and protein will determine the energy and protein content of the milk available to the foal. Diseases contracted by the foal may determine its health and performance as an adult. The milk will be the sole source of building blocks for the foal’s immune system. Hence the importance of proper nutrition to the mare to ensure a fast start to the foal’s young life.Proper care of the mare during gestation and lactation determines the health of the mare, current foal and the foal-to-be.